Going out with a "veg-aquarian" (someone who eats vegetables and fish and other seafood but no meat) has initially presented a little bit of a challenge for someone who has publicly declared that she "would rather die than give up meat". No doubt a veg-aquarian is more tolerable than a vegetarian or a vegan in the books of the devoted omnivore (well at least I'm not a pure carnivore, veggies form more than a token part of my diet), but it still presented some dietary issues when working around cooking at home or eating out when the meal involves sharing rather than the "you eat yours, and I'll eat mine" style. For someone who is so much of a foodie, that eating and having the knowledge of good places to eat, form important aspects of o ne's life and the entire make-up of the person, food-compatibility (this doesn't just mean diet, but also the value a person places on meals and food in the general scheme of things) is imperative. As such, this has meant learning to cook and grocery-shop more creatively, eating meat at meals where only other carnivores are present, ordering meat whenever joint meals do not involve sharing (like a mini-pizza which may be too small to be shared) and eating more fish. It also helps that this veg-aquarian is a foodie in his own right as well, and can whip up some pretty decent fish dishes which taste as good as they look. Food and life, after all, are all about nothing but choices. We went on an impromptu tour of the inner west suburbs this afternoon in a bid to check out one of the (near to the city but not quite type) suburbs which was touted by the newspapers' real estate supplement as being a good alternative to young couples who have come to the sad realisation that they cannot afford to buy a property in the popular eastern suburbs where they have been renting. We had gotten lost in the suburb that we were checking out and had hopped on a bus which took us to the next suburb and which didn't look like there was any cafes, shops, restaurants in the neighbourhood. We finally hopped off the bus when we found some signs of civilisation and at the shop where we bought some drinks, got directions to the nearest train station. The bad news when we got there, was no trains were running due to the omnipresent weekend trackworks. The good news was there is a bus replacement. The bad news was we didn't know when the next bus would come. The good news was it came within 2 minutes. And that was when we had our impromptu tour of those suburbs as the bus meandered through the various neighbourhoods. The conclusion we came to was it would be a long time coming before the recommended suburb would become gentrified and we didn't think we could live there in its current state with its current inhabitants for the next "x" years before gentrification descended upon the neighbourhood. The neighbouring suburbs that we had toured were also not within contemplation. We were just too fond of our little inner city village, with quaint cafes and nice restaurants, the kooky, bohemian inhabitants and the great weekend markets and other little shops. The more fun part of the afternoon was the Newtown Feastability - a food and wine (and music, drag queen shows, bands) event. 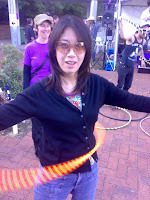 I succumbed to the hoola hoop furore that was going on with the professional people (planted of course, amongst the enthusiastic group) doing fancy moves and the mere mortals, just trying to keep the hoops at waist level. Finally, the big day. Not ours but G's old flatmate's which we had been getting ready for, with the hair, dress, shoes etc (for me of course, G just wore his fave work suit aptly nicknamed "the wedding singer suit" when he bought it, for the shade of slightly shimmering bluish-grey). It was a chilly Spring day which saw a bit of the sun peeking through but quickly went back to being windy with a cold nip in the air. I think the best part about going to Church which I like, is the singing of hymns. It never fails to evoke a sense of ... being move d. It's inexplicable. The service was quite short, the sermon was interesting, modern and meaningful. The pastor said that it's people's differences that brought people together, and should not be a source of conflict but a source of strength to complement each other. The dinner reception was held at the University hall, quite reminiscent of what I would imagine Hogswart's great hall would be, except on a much smaller scale. The food was beautiful (when it finally came). We had to resort to various tactics to attract the servers who were bearing platters of finger food at the cocktail reception before dinner was served. We tried telepathy, moo-moo hungry eyes, the evil we-are-hungry-and-we-mean-business stares, forming a line to direct them towards us and creating a welcoming circle to enfold them into our midst type of formation as well. Towards the end of the cocktail reception, they started to fall under the charms of our various methods and the food which barely made it near us earlier started to come in streams. But it could also be that they realised that dinner was going to start soon and they had to get rid of the hors d'oeuvre - quickly! My faves were the prawns with shredded coconut on skewers and the chicken salsa on mini pikelets. The dinner itself was also fabulous, I had the rack of lamb for my main (G only ate the accompanying french beans and the potato rosti as there were no vegetarian/seafood option, strangely enough) and enjoyed the cheese cake with raspberry compote dessert even though I am normally not very keen on heavy cheese cakes. The biscotti that went with my tea was deliciously light and flakey, and G wanted me to sweep the leftover handmade chocolates into my little handbag, but I staunchly refused to cave in to such boorish behaviour (I said I might consider if the other people at our table had gone out to the bathroom or for a smoke). 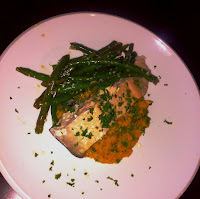 I have no pictures of the food as the camera was too bulky to slip into my little dinky evening bag. But the memory and discussion of the yummy dishes continued long after the dinner and proved how much we had enjoyed ourselves. This is a linen dress made from vintage fabric and from a vintage dress pattern. 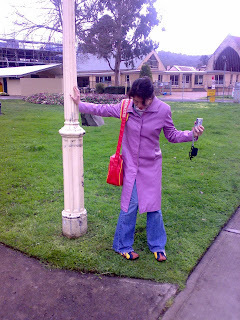 It is not a mass-produced, made in China dress, but sold at Australian prices. Neither is it pre-loved to which I would have a different attitude (depending on how much I liked it I guess, but generally just being near a rack of pre-loved clothes would trigger off an allergic sneezing attack). It was a fortuitous find, in the closing minutes of Rozelle markets. The sleek silhouette of the dress with the old-fashioned looking lace trim on the hem and slit appealed to me. The rosette in the front with the double string of seed pearls added a focal point. It was a tad roomy around the armholes but it was a great dress, and a fabulous find. I am really pleased with it. The stall-holder/designer deliberately searches for vintage fabric where possible and uses retro dress patterns. This is one of the quirky things about markets that I love so much. A mall is a mall is a mall, but markets are a different story altogether. The decision's made, after a long and arduous hunt for "the dress" to a wedding where I don't even know the bride or groom or for that matter, anyone else except the person I'm going with, the hunt hasn't yielded any real result, but has caused some tears and frustrations in the course of it. So with this fortuitous find, I've made up my mind that I'm wearin g this vintage dress to both the church and dinner thereafter. Also from the same market but on the following weekend, I picked up these retro buttons on a whim. I feel some creative juices flowing in me, and just wanted to put them to good use and I couldn't resist these colourful buttons when I saw them. It's been a while since I did anything arty-crafty and I really feel I need to do something soon. I walked on the grass to get a closer look at the pretty Spring flowers in a little park while we were in Mittagong. Suddenly G pointed out the many lumps on the grass and asked if they were doggy poo. I had trod on one, it was all squished on the soles of my shoes. I realised the entire place was covered with these brown doggy poo longish clumps and I was surrounded by and trapped amongst all the doggy poo! Getting more traumatised by the second, I tried to tip toe my way out of the" mine field", avoiding the "land mines" as best as I can. I was pretty agitated by the time I slowly picked my way out of the grassy park to the pavement and frantically tried my best to scrape the flattened brown muck off my shoes, against the grass as best as I can. We vowed to brave the constant drizzle that was supposed to afflict the APEC long weekend despite the fact that we were into the first week of Spring. Warmly clad in a jumper, my woolly scarf which hasn't seen the outside of my cupboard in a month, my waterproof/windproof long overcoat and armed with a brolly, I was ready for Mittagong. The train ride to Mittagong took 2 hours, it started to look like countryside landscape after an hour on the train. The grey clouds looked threatening but at least they didn't result in lashing rain, just a light drizzle when we got to Mittagong. It was lunch time when we arrived and the main street was not a really long nor busy one. We checked out a few cafes a nd I vetoed the first large one we came a cross, even though it was crowded because I figured that was because it was the first cafe nearest the railway station, hence convenient to the tourists and hence not local enough. We agreed on a little, local-looking cafe, and I ordered a quiche lorraine with new potatoes. That was pretty tasty, however G's fish burger turned out to be 2 tiny strips somewhat like fish fingers, sandwiched between a toasted bun and was disappointing. After we had somewhat satisfied our hunger, we started to explore the little town. First stop was a Vinnie's shop and boy, did we find some treasures! Ever since we saw "La Vie En Rose", G has been on the prowl for hollow-stemmed champagne glasses. We found some in a shop in Glebe, the set of 6 was going for $60, G convinced himself that he didn't need 6 champagne glasses, considering he already has champagne flutes. We then saw individual glasses for sale at the Surry Hills Antique Centre, at $20 apiece. And these at Vinnie's? A steal at 30 cents each, $1.20 for 4 glasses. It was such a shock, we couldn't believe our luck. We also had an animated discussion as to whether we needed the other 4 with rose etchings for $6, and we concluded that they were such a bargain, we would find some use for them, or a deserving friend or occasion that would warrant such a gift. The ones with the etchings could be from the 1950s as identical etchings on different-styled glasses at the Mittagong Antique Centre, were so labelled. Our joy and excitement at our luck just could not be suppressed, we were GLEEFUL. I picked up a tea cup and saucer set at the Antique Centre, which were touted as a "Victorian duo" (more like "in the style of" I'm sure). What caught my eye was the unusual lime green shade, usually these English tea cups are in pretty shades of pink and red. I had been meaning to add to my meagre collection (by chance) of 2 tea cups which I had found forlornly discarded at the ground floo r of the apartment block of my first flat. Those were a good find, and one of them was actually a light green as well. Teochew Red. This is what my mum calls this shade, the colour of my new cocktail shaker. It's a funny description but it has stuck firmly in my mind whenever I see this colour. When I first got this apartment, G started making his grand plans about setting up a bar here as well so that "we" (the originally alcohol-intolerant person who has now begun to tolerate wine and actually like some and can only (actually) tell the difference between a good, smooth wine and a sharp, bleah one) can have drinks both at my and his place. I do like his Cosmopolitans and have put in a special request for him to make a less potent version for me the next time. So we started with procuring the martini and champagne glasses the first week or so after the move. And he's finally found a shaker which he likes enough to get for me. In Teochew Red no less. I guess he now knows me enough to realise my love for colours and a plain stainless steel one would not be as much appreciated as this one. What's life if not for a splash of colour here and there? Spring arrived with a promising start. My little cactus flowered, a once a year event, it knows the changing of the seasons and the budding and flowering heralded the coming of Spring. Then 2 days into the new season, the weather turned chilly and windy and I almost froze last night because I didn't have my winter coat. It has been 3 weeks since I last put on a winter overcoat to go to work, and today, the fourth day of Spring, I had no choice but to pull an overcoat out of the closet again. It was a very good decision because the temperature dipped to 16C maximum, it was windy and felt like Winter all over again. I certainly hope this Spring isn't like last year's which really felt like Autumn. I look at my flowering cactus and hope.